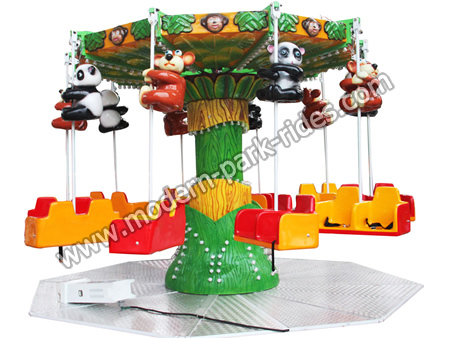 The ride is a fairground ride that is a variation on the carousel in which the chairs are suspended on chains from the rotating top of the carousel. This type of swings ride is present at even the earliest amusement parks. Luxury shook his head amusement flying chair like an umbrella shaking his head, hanging a lot of the beautiful, delicate, and the safety of lifts in the rotation of the umbrella, hanging chairs undulating in the air to rotate flying. The device rotates, take passengers hanging chair as if flying in the sky, they can experience the excitement of harvest and happiness.